This week, I’d prepared some images to help demonstrate the benefits of building information modeling (BIM). In our MEP department, the vast majority of our projects are modeled in Revit. In fact, the only times we’ll complete projects in AutoCAD (2D) are when we’re making modifications to a project that was already designed that way. Otherwise, all projects are modeled in 3D. Often, we’ll work with an architect who’s not designing a building in 3D. In those cases, we underlay their 2D floor plans, and offset each level appropriately in Revit. We then build our MEP systems in 3D. There are advantages to this workflow for us. One of them is that we don’t have to maintain AutoCAD and Revit standards separately. But a big advantage is the visualization that comes with modeling in 3 dimensions. To that end, Revit offers a number of tools that allow us to view ductwork, structure, piping, walls, etc. from different perspectives. Rendering, to gain a more realistic view, is also possible, and our architecture team uses that tool often for presentation purposes. While all of these options within Revit are useful, they’re also often slow. That’s where Navisworks can help. Building Systems are shown through transparent walls in this multifamily building. Navisworks will show 3 dimensional models, less many of the systems and constraints that Revit uses to help designers model buildings, which is what slows Revit down. That is, one can export a view from Revit, to Navisworks, and the result will be a visual of every 3D object, less the large database of properties and parameters that go along with those objects. Some of that information is transferred, included the name of objects, their classification (window, duct, door, etc.) and what level of the building they’re modeled on. Material properties are also retained for appearance. Other information, such as data for schedules, constraints, etc., are cut out. The result is a model of the building that can be quickly and easily manipulated for visual purposes. 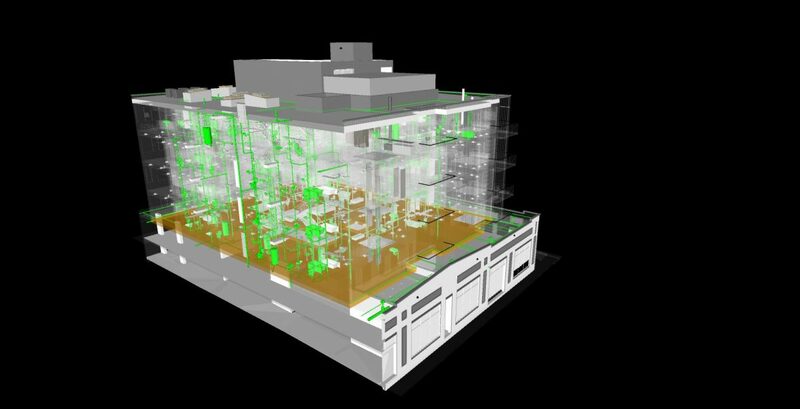 Once exported to Naviworks, it’s possible to select any component of the building, see what it is and where it was modeled, as well as change the color, the transparency, or hide it all together. Using the selection tree, classifications of objects can be changed all at once. For example, an entire floor can be hidden, or all of the structure can be made a brighter color. Aside from making pretty pictures, this is particularly useful for complex buildings where coordination is more critical and it provides an excellent check for designers, as well as a powerful construction aid for contractors. In this photo, plumbing systems and a post-tension slab are isolated and color-coded to aid in coordination. Navisworks Manage includes another tool called “Clash Detective” which will identify collisions between 3 dimensional geometry in the model. Due to the ease at which one can view a model in Navisworks, identifying where collisions occur is easier and faster than it is in Revit. With both programs open, a designer can then make modifications to a Revit model as part of a quality control process. Navisworks allows a user to select specific objects to search for clashes, for example ducts and structural columns. One can even set tolerances and identify objects that are merely close by, which is useful if certain clearances are required around equipment, or to ensure that adequate space is provided for accessibility. Here at EVstudio, we’re visual people. 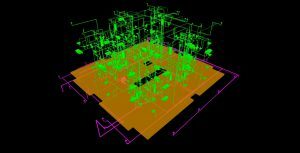 We also strive to be on the forefront of BIM adaptation, and to do so without bogging down efficiency. 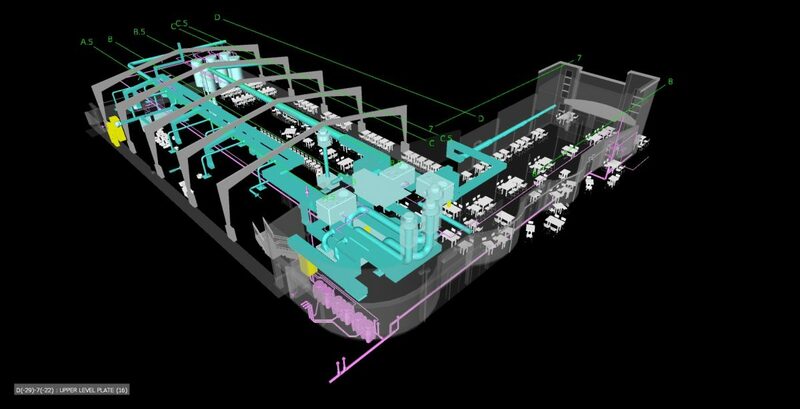 By utilizing visual aids, such as Navisworks, we’re able to improve the designs we offer our clients. In this photo, a post-tension slab is highlighted within the building. Navisworks, AutoCAD and Revit are all Autodesk programs.